The Creative DiVi-CAM 525D camcorder doubles as a 5 megapixel digital camera and provides stuff such as movie recording (including MPEG-4), real-time TV recording, a 5-megapixel digital camera, MP3 music player, voice recorder and webcam. The DiVi-CAM 525D from Creative makes it possible to record straight from TV, DVD player, VCR, Digital Set-top box and such like. The Divi-CAM also includes a 5 megapixel stills camera with 8X digital zoom which can be increased to 10 megapixels via in-camera interpolation and features shooting modes like Normal, Portrait and Macro. The Creative DiVi-CAM 525D camcorder is powered by a (1100mAh) Li-ion rechargeable battery and includes 32MB of internal memory. 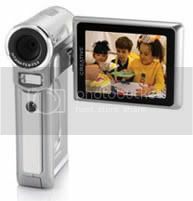 The camcorder will be available from June of 2006 onwards for a price around $229 (USD).